Optional: A little Lemon Zest for those of you who like a bit of Zing! Combine mustard, lemon juice, black pepper, garlic and zest (if using) in a large freezer bag and swish it around until it is thoroughly combined. Add your chicken breasts to the bag, seal it and swish away, making sure the chicken breasts are thoroughly coated in the marinade. At this point you can label your freezer bag and pop it into the freezer for later use. 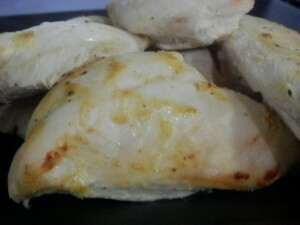 Cook chicken breasts using your chosen cooking method until the chicken is cooked through, the chicken is no longer pink and the juices run clear. Serve chicken with your favourite side dishes. Notes: In my cooking world, Swish is, in fact, a technical term!